USANA Health Sciences, a global nutritional company, announced today that its Philippines subsidiary UHS Essential Health Phils. 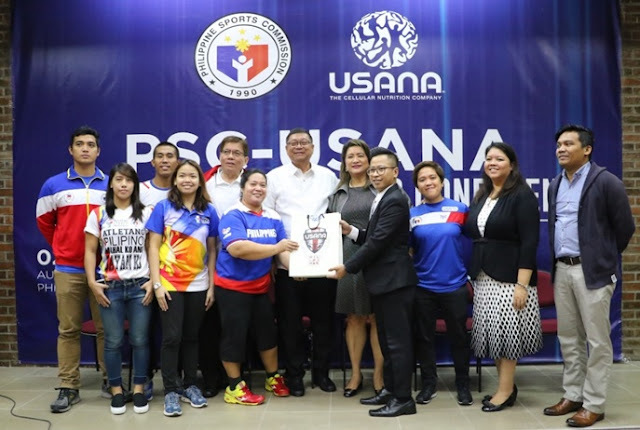 Inc. (locally known as USANA) has entered a partnership with the Philippine Sports Commission-Philippine Sports Institute (PSC-PSI) for the health improvement of 300 elite national athletes. PSC Chairman William Ramirez says the partnership is in line with the commission’s vision to promote sports and athletics among our youth as well as improve the national athletics program. “The timing of this partnership with USANA could not have been more perfect. We are in full swing with our preparations for the upcoming international competition and adding USANA’s high-quality nutritional supplements to our athletes’ health program will help in their training while reaching optimal health as well,” says Chairman Ramirez. “It is a privilege to work with the PSC-PSI in their goal to get our athletes ready to represent our country in the international sports arena. We are proud that we are able to provide Filipino athletes the same pharmacy-grade, safe, NSF-certified and World Anti-Doping Agency (WADA)-approved nutritional products being enjoyed by world-class athletes,” says Aurora Gaston, USANA Vice-President for Philippines and Indonesia. “This partnership is our commitment to the Philippine market who has helped our company become the leader in nutrition here and abroad. USANA will provide their three top products namely Essentials™ Pack, CoQuinone®30, and Procosa® to the identified beneficiaries for two years. USANA Essentials™ work from the most basic building blocks — at the cellular level — with the right amount of nutrients, minerals, and antioxidants every day to improve your health from the cell up. CoQuinone®30 is all about energy, on the cellular level. USANA combined alpha-lipoic acid with coenzyme Q10 to create CoQuinone 30, a fantastic supplement of these energy-supporting nutrients. The benefits associated with these nutrients include sound muscle function, healthy nerve function, and good cardiovascular health. Lastly, Procosa® supports optimal joint health and activates the cell's natural ability to protect and renew itself. The combination of glucosamine and Meriva in the InCelligence Joint-Support Complex helps to influence the signaling pathways that proactively promote an optimal immune and inflammatory response to restore normal function after exercise. “These 3 products have proven their effectivity by athletes around the world, and we are happy that our fellow countrymen will have them during their training,” added Gaston. To foster transparency on the implementation of the partnership, the products will be distributed directly to the 300 national athletes throughout the two-year partnership. This is not the first-time that the nutritional company has given its support to the Filipino athlete. Through its Team USANA Pilipinas campaign, over 30 national athletes in the past and until now have received sponsorship from USANA, namely Rio Olympics weightlifting silver medalist Hidilyn Diaz, SEA Games Gold Medalist Nikko Huelgas, Philippine Azkals top footballer Misagh Bahadoran, Star Hotshots player Peter June Simon, Ginebra San Miguel Beer's LA Tenorio and former world pool champion Rubilen Amit, to name a few. This sponsorship is an additional initiative to USANA’s on-going advocacy in helping some 3,000++ elite athletes in 20 other countries. USANA first started working with athletes in 1999 when USANA partnered with U.S. Speedskating and Speed Skating Canada. Since then, USANA has provided thousands of elite and professional athletes around the world with high-quality nutritional supplements to help them perform at their best. These groups include: the Women’s Tennis Association, the US Ski and Snowboard Association, members of the Korean Speedskating Team and National Judo Team, and more. Visit Team USANA for more information.